What a pleasant surprise for me that I received email from Dr. Glenwood Irons again. you may also remember Dr. Glenwood, the author of Flight to Shanghai: A Journey in the Plague Year (II, III, IV). It was the only time that I co-author this blog for the entire 3 years of blogging, because the topic is so interesting and Dr. Glenwood’s entry was so well written. This time, he sent me some pictures he took near the Lugu Lake. He obviously took the most moving moments – dancing and group photo with the women in that village – the villages where women enjoy much more rights than men. It reminds of the my trip to Lugu Lake in the May holiday. I have uploaded some photos of my Lijiang trip onto Flickr.com. Refresh to get random pictures. The best part of my trip to Lijiang is the Ancident Music in Lijiang. I would recommend everyone who visit Lijiang to be there. There is another show on the opposite side of the street of this show. It is also wonderful! I spent the two nights in the local theatre. In Lijiang, I spent one afternoon drawing my own T-Shirt with Wendy. In Lijiang, it is a huge business to draw the Dongba characters on T-Shirt and sell the T-Shirts to tourists. It seems every 1 out of 3 stores have those T-Shirts. I suggested we buy some white T-Shirts and borrow the color and brush to create our own t-shirts. So, this is the whole story. Jian Shuo with the pen. Wendy also draw another T-Shirt. She draws better than me. The work took the whole afternoon to complete. There were too many people watching us drawing that they almost blocked the road. This is for everyone who are curious about the place but doesn’t have too much basic geography knowledge about China. The most beautiful part of China I have experienced is the south-west. There are three provinces: Sichuan, Yunan and Tibet. In October, 2002, I started from Chengdu and visited Daocheng – that was about three-day car’s ride. This time, the trip is much easier. 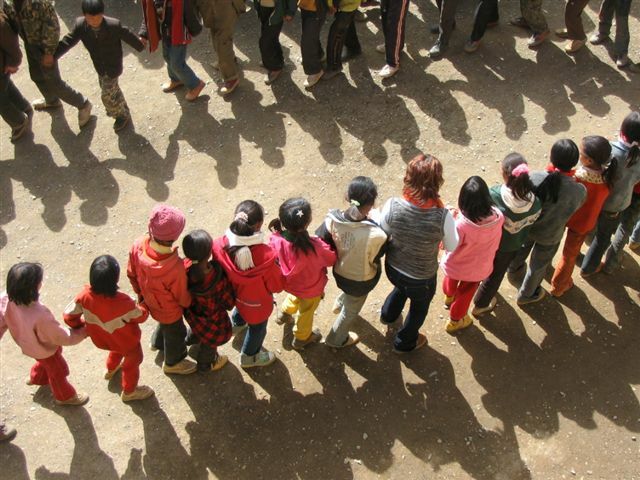 I took flight from Shanghai to Kunming, the capital of Yunan Province, and transit to Lijiang. Lijiang is the ancient small village with rich culture. What impressed me so much is, they have an airport! Even some big cities in China does not have one. Lugu Lake is about 240 km away from Lijiang. We took bus from Lijiang to Lugu. It cost 5 hours and 120 RMB (15 USD) per person. We started at 9:00 and arrived around 15:00. Wow. The road was the typical winding road on the mountains. It is also dangerous – the cars can easily fall into the valley. 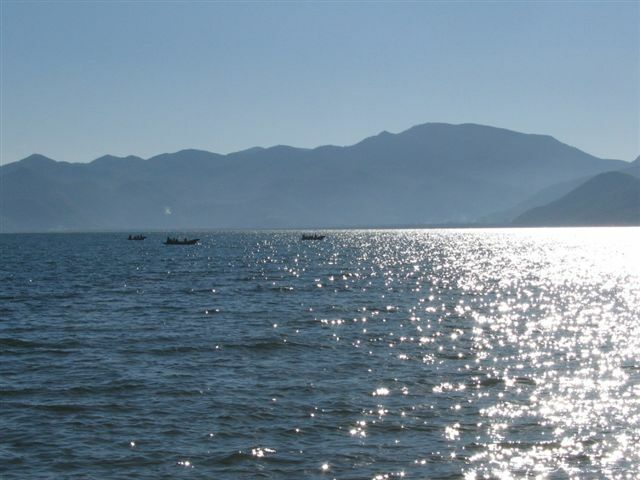 :-) The Lugu Lake is about 2685 meters above the sea level…. The most interesting part of the lake is, the people in the villages are still living in the Maternal families. It means, they do not marry. 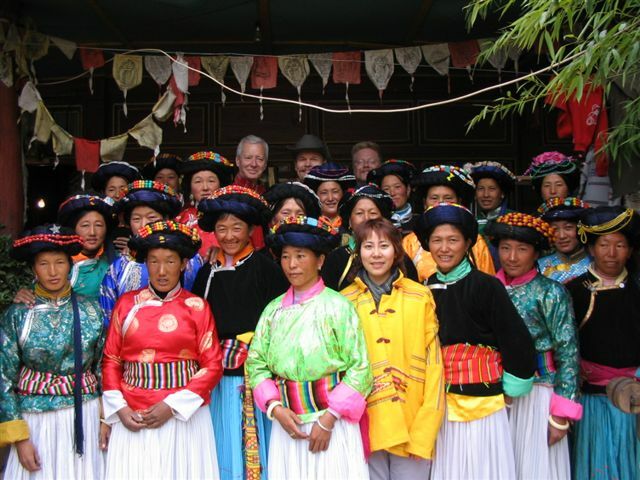 Visiting marriage represents the main marriage system of Lugu Lake’s Mosuo people. There are only mothers. There is no concept of father. It should be the last matriarchal culture in the world. Now, Lugu lake is not only a place of Lugu local people. Many people settled down there. The owner of the hotel I stayed is among them. I spent some time on the architecture of the wooden house I stayed and finally believed they can move the entire house to a new place within three days. The wooden house is very simple. There is no simple nail throughout the house. It is simply made up of a lot of building blocks, that can be put one upon the other. The owner shared the story with us: He went to a old Mosuo village and fell in love with this house – a house with 100 years of history. He gave the owner about 10,000 RMB and bought the house. He gave the workers 15 days to move the house to a new place. The local workers laughed loudly and said 15 days are too much. Finally, they spent one day marking the woods in the house and tore it down. They spent another 2 days building it up. :-) Amazing story. The cost per person per night is 30 RMB. We know that is raised price due to the May holiday. I assume the price should be much lower in normal days. Lugu lake may not be great place to relax. Many people came here for walking, either walk around the lake (in two days) or march toward Daocheng. It takes 7 days… For me, an inn (typically combined with a Cafe) is good enough. The lake, birdeyes from the top of the mountain. The Mosuo Wangshi Inn I stayed. The computer and Internet facility in the Inn. What impressed me most is, it may be among the most Internet connected villages in the country. Almost every inn provides Internet access (some with wireless coverage), so I can use my own computer to send out the 14 pending emails from my outbox (via VPN) and upload the pictures above to my server. The connection is ADSL… Meanwhile, accompanied us along the way are the China Mobile and China Unicom radio transmission tower. I never experienced “out of service” on my mobile – GPRS also follows me. IF the transportation is better, and there is enough policy support, the west part of China has the potential to be a software base – the infrustructure is ready, maybe what we lack is 1) education and 2) Funding… When I took the boat in the lake, it gives me the feeling that it is very much the sailing in bay area. I do hope one day, the west part of China raise up to be another bay area. He said he had run after many dream but turned out to be very disappointed. So he settled by the lake. “Have you found what you want here?” Asked Wendy. He replied: “Still not”. Maybe it is all about “Enjoy Doing or Being Able to Do“. I will be at Lijiang and Lugu Lake area in the May holiday. :-) and will get back on May 3. I don’t have the same expectation as I had for the Daocheng trip, but I believe it is some place for me to sit in the Sun and really enjoy the peace of life.